43714 Rd. 415, Coarsegold, CA 93614 U.S.A.
Our new office hours are 8 am-2 pm Monday – Friday P.S.T. Visits to the nursery by appointment only. 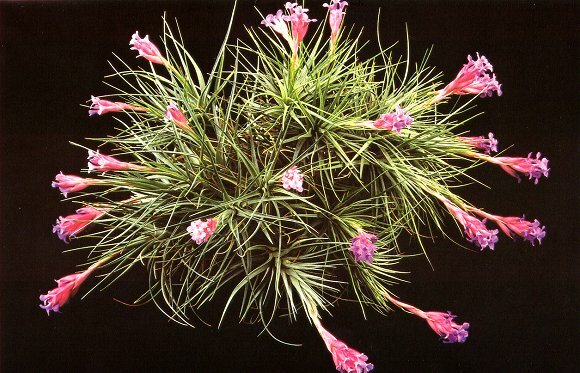 Airplants are the common name for Tillandsias (sometimes called "Air Plants"). Not all Bromeliads are Airplants. 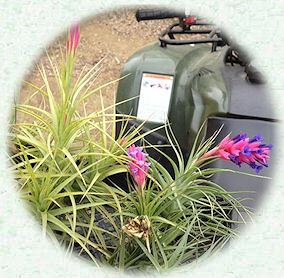 Air plants grow without soil while most types of Bromeliads do best in soil. In order to better serve our customers, we urge you to use our secured online order form or fax. (559-658-8847) to send in your orders at any time. This helps eliminate errors in addresses, phone numbers, and species names. You can also send your order, shipping and payment information to frank@airplant.com as well as any inquiries you may have. please click on the button above! Just wanted to let you know that I received the order I had placed for the large assorted. I have to tell you how please I was with the plants and the assortment. Not sure if you have a place on your website but you should so customers can let others know that their money is safe and that they are getting even more than they could have imagined. I told my friend and she has put in an order as well. We have lots of friends that love the airplants and will be putting in orders as well. This is our 3rd company and I believe we have found the right one finally! 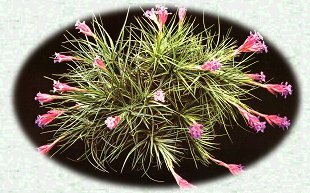 I've placed several orders per month with Tillandsia International for about 4 years. I find their service and products outstanding! Orders are easily made by internet or fax 24 hours a day and are processed accurately with blazing speed....packed, labeled, and shipped within hours. Plant quality can’t be beat....my customers keep coming back for more. As a specialty plant grower and retailer, it is important that the companies with whom I transact business be reliable, responsive to my needs, have a quality product that is priced right, and that they provide outstanding customer service. I find the staff of Tillandsia International to be all of the above and so much more! My business, ALCJR Enterprises, is located on the East Coast. I have had the pleasure of visiting Tillandsia International's growing facility on the West Coast and personally meeting the staff. You could not ask for a greater group of people with whom to deal. When it comes to quality, service and price, they receive a 5-star rating from me. I love shopping at Tillandsia International! I have been ordering from Tillandsia International for 3 years now, and the quality and variety are simply amazing. I never knew air plants could be so much fun. My customers love them so much they have become my best selling plant.